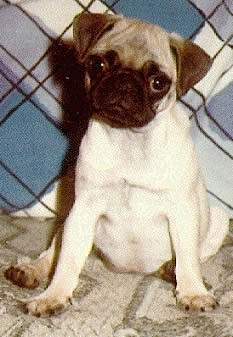 It was May 1974 when our first Pug, "Puggy," came to live with us. Times were good for Anne and I. We had just purchased our first home and would move in the early part of June. What better time to bring a new addition to our family. While in our apartment we tried several times to have a dog, but it just didn't seem to work out very well for Anne and I since we both worked. As a child I always had pets. My first dog, Trixie, a mixed breed, was 6 months older than me and died when I was 16. After that my Mother and Father had a succession of Toy Fox Terriers which were small and friendly enough. My first few years of marriage were the first time I had ever lived in a house without a dog. When the time came to select our new pet I had two requirements: a small breed dog and a dog with a pedigree. We chose a Miniature French Poodle thinking he would be a suitable breed for an apartment. Wrong! He was high strung and difficult to train. If I was home and he needed to go out he would sit by the door and get my attention. If Anne was home alone he would just pick a corner and go potty never letting her know anything. For some reason he did not like Anne and it was evident. After unsuccessful attempts to train him he went to live with my in-laws for several years before running away and never returning. Our second dog was not selected by Anne and I. It was a mixed breed stray about a year old that my sister found roaming the streets. He was of medium build and a pretty dog but, he, too, was not suitable for being alone in an apartment all day while we both worked. One day when I returned home from work I found deep gouges in the door where he had pawed trying to get out. We quickly searched and found a good home for him where he lived a long and happy life. And, with those two experiences, we delayed trying another dog until we had a house. I can't tell you why we selected a Pug. We knew nothing of the breed to speak of. I guess we just fell in love with that sad "take me home with you" look that she gave us from the cage in the pet store. With that look and the money paid she was placed in a cardboard box for the short ride to our home. For the next several weeks, until moving day arrived, she was the perfect little apartment dwelling Pug. She wasn't loud and she seemed eager to learn what we wanted to teach her, like potty training. When moving day arrived for some reason we placed her back into her little cardboard box for the short trip to our new home. Don't ask me why we did that as it was not necessary, but I guess with everything going on it was the safest place for her. I will never forget taking the box from the car with her in it, placing it in the center of what was now her new and large yard and opening the top. She quickly climbed out of the box and immersed herself in the tall grass. It was obvious she loved it. of the skunk kind! 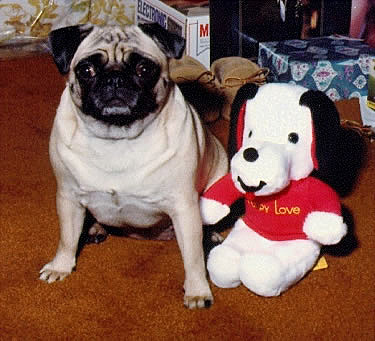 Puggie, without question, was an exceptionally gifted dog. She had the ability to endear herself to any and everyone, especially family members. She and I quickly became pals and were almost inseparable throughout her life. There was hardly a time when the question "Wanna go for a ride" went unnoticed or ignored. She went everywhere with me and, quite often, our trips were specifically for her. Like our trips to the local park where she could roam freely and observe other people and dogs. She never strayed far from her daddy's side, but she led the way on many occasions. 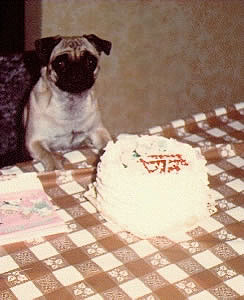 Puggie was also my first introduction to a dog that ate any and everything. Her appetite was amazing and it was soon evident that we would have to watch her food consumption closely or we would end up with a blimp on our hands. Her favorite trick which I taught her was to give me a massage. I'd lay on the floor face down and call her by saying: "Get up there." With that she would jump on my back and begin to walk in circles. While Pugs are not the heaviest dogs on Earth it's amazing how much weight and pressure they can put on a paw measuring about an inch and a half across. I have to admit, it felt good to have her walk on my back, and she, too, enjoyed doing it. I think she knew it pleased me. 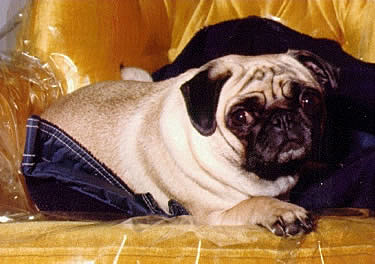 Puggie interrupted at nap time on one of my jackets. A must for good sleeping! 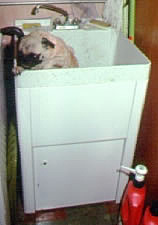 Sadly we lost Puggie when she was only six years old. I returned from a business trip and as soon as I saw her I knew something was wrong. Her tail was limp, something that never happened. She always had a tightly curled tail. 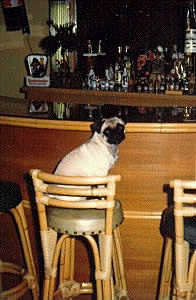 I immediately took her to the vet and was advised that is was her back, that Pugs were prone to back problems. They gave her a cortisone shot and some medication. She improved immediately and I thought the worst was behind us. As soon as the medication ran out, within a day or two, she relapsed. I immediately returned to the vet and was advised that she would need a back operation. I was willing to pay anything and do anything to get her well. We left her at the vet for the operation and returned home. Within a matter of several hours we got the call that she had died. The family was devastated. Here it was just two weeks before Christmas and we had been in our new home only six months when she passed away. To this day I don't believe it was a back problem at all. It had to be something with the brain stem, a problem we would be introduced to later. The night she died Anne and I were in the middle of making a Christmas wreath to hang over our new fireplace. 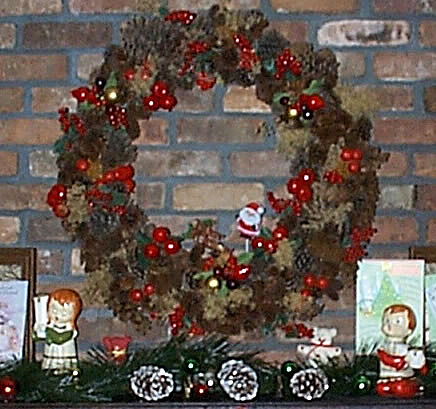 That wreath has since become known as "Puggie's Wreath" and serves to remind us each Christmas of what a wonderful addition to our life she was if only for such a short time. We will always remember her and cherish the memories we have of her toady.